One of my favorite things to see online is how other people set up their desks for productivity and gaming. This page shows various ways I've set up my own desk over the years, as well as links to other people's desks that have inspired me. I hope it will give you some ideas. Another month-long stint at home, another re-thinking of my desk. This time it involved a lot of red ropelight, and the need to seriously use the TV as a second monitor (because my old MBP with a broken screen needed to use one as a primary display). It must provide enough light to allow me to find things on my desk and not trip over things in the living room. It must be easy on the eyes, and not draw focus away from my monitor(s). As a bonus, it should make my apartment feel like a submarine. I also added some matching ropelight around the underside of my bed frame, giving the bedroom floor a similar red glow. I hope to someday do the same for the kitchen and hallway/bathroom, so that the whole apartment will be navigable at night without turning on bright lights (and I especially want to replace my fridge light with a red one for midnight snacks). And then someday it will all be linked via home automation units, which will turn on all the red running lights with a single press on my iPhone. But I need to pay off my computer, and I'm never home, so spending a couple hundred bucks on that kind of awesomeness would not be worth it right now. On Flickr you can see the photo with all the parts labeled. These two photos link to my Flickr account where you can mouseover to read the details on the photo. 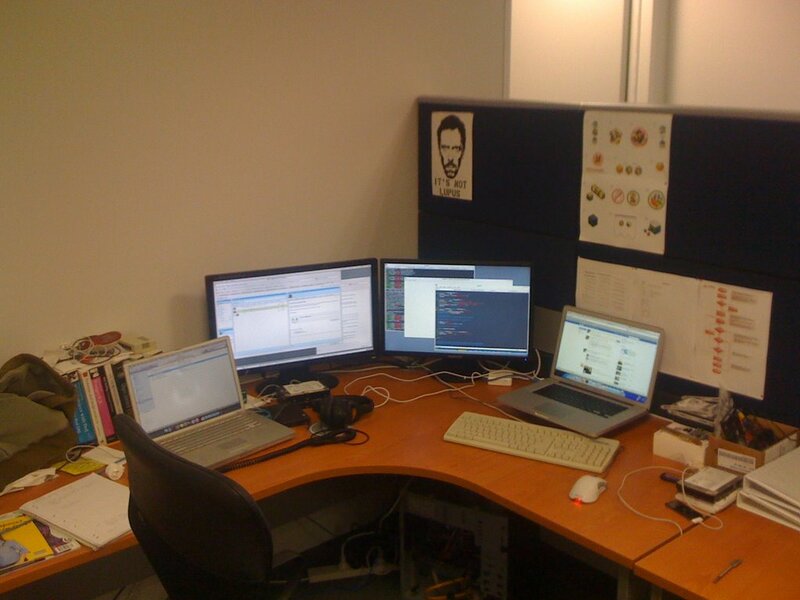 My desk is one of Ikea's office furniture set which can be configured about a million different ways. It's an L-shape which is 31" deep on the left side and 23" deep on the right side. The right side contains a lot of accessories and not much electronics. 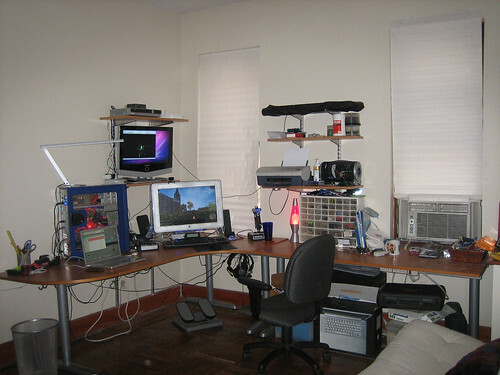 I also have shelving over both sides of the desk which holds envelopes, blank CDs, my cable box, router, modem, and printer. The shelves are from the Container Store. As you can see, the monitor is an old Apple 23" Cinema Display. It's used mainly for my PC, but it's run through a KVM switch that converts the old ADC connector to DVI and can send a second DVI line to my laptop. It actually has the capability to switch control of the screen, keyboard and mouse between the two computers, but since my laptop moves around so much, I don't bother to use it unless I'm doing a project that requires a lot of screen space. The TV on the shelf also can be used as a 2nd monitor, but all the way up there it's only useful in limited circumstances. Under the desk are my rudder pedals, and the little dodad on top of the monitor is TrackIR. I recently improvised this shelf you see under the monitor to raise it to a more comfortable viewing height. It's also supposed to be high enough that my G15 keyboard's screen can tuck under it, but it needs a few more millimeters. It's just a spare Ikea shelf held up by a bunch of empty jewel cases taped together. In the current photos I have the monitor still on jewel case stilts, but not as high, which is a little better height. This was my setup when I first moved into my current apartment. I have since moved all the computer stuff around a bit (see above). Basically what didn't work is that the PC, which is most in need of tinkering and access to the internal components and rear connectors, was buried in the back where it was impossible to get to. Meanwhile the TV, which pretty much has two states -- on or off -- is on the edge of the desk with lots of access. That's why they've ended up swapped. The advantage to this setup was that I could see into the PC case from my chair, which is both attractive, and useful for checking that fans are running, and the status of the RAM sticks, which light up when in use. The amp for my surround headphones was under the table (next to the bottom-mounted hooks which hold said headphones), but the shelf which held it was made of cardboard and eventually broke. It now lives under the monitor where it is equally out of the way, and the wires don't have to run all over the place. I don't use the stand for the laptop anymore either, as having to type without my wrists supported was rather painful. You can see here I had an Apple keyboard under it, which works OK, but eventually the keyboard broke and I think I just decided that using the built-in keyboard and trackpad was easier than having an external keyboard and mouse taking up desk space. I also didn't like the idea of the laptop being operated on an angle too long, because the hard drive would not be flat. I'm not sure if that's just me being paranoid, but I didn't like it. This is my old apartment and desk. This was relatively close to when I moved so the gear is the same as the 2006 picture: Powerbook and PC, and you can see the iCurve better. Off to the right you can barely see my old TV. 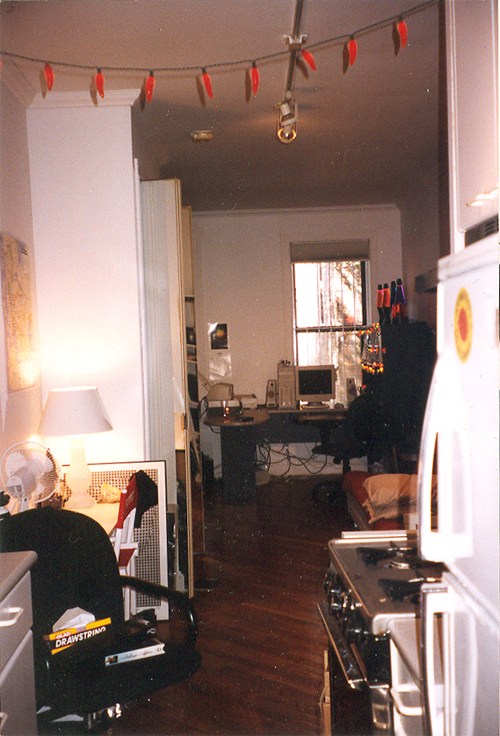 For the 8 years I lived in this apartment I had a 13" TV, which fit nicely under the shelf of my desk. That iPod is a 4th Gen custom painted by ColorWare. 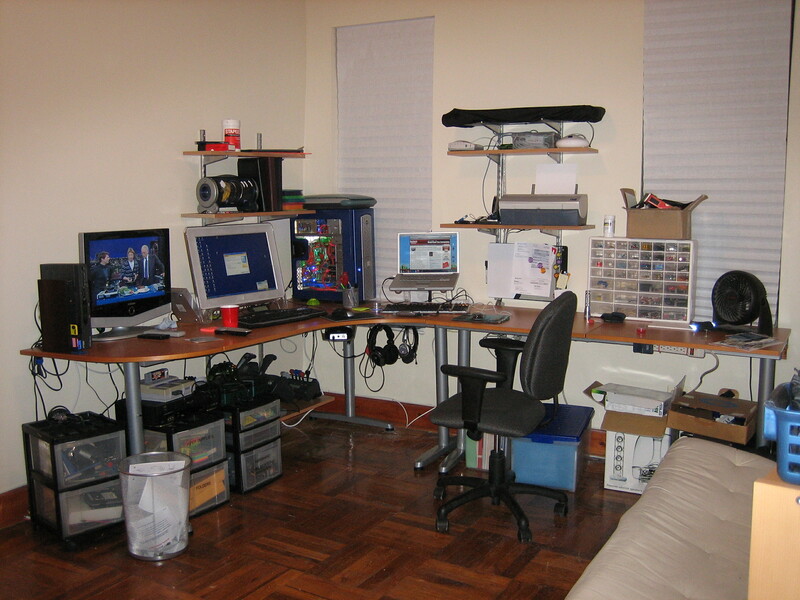 When I first moved in, I had a U-shaped desk, which I thought was really cool, but since my apartment was very small, I eventually realized that making the desk an L-shape was a more efficient use of space. In the years I lived there, the "L" moved all around the room multiple times, but spent most of the time in the corner shown in these photos. 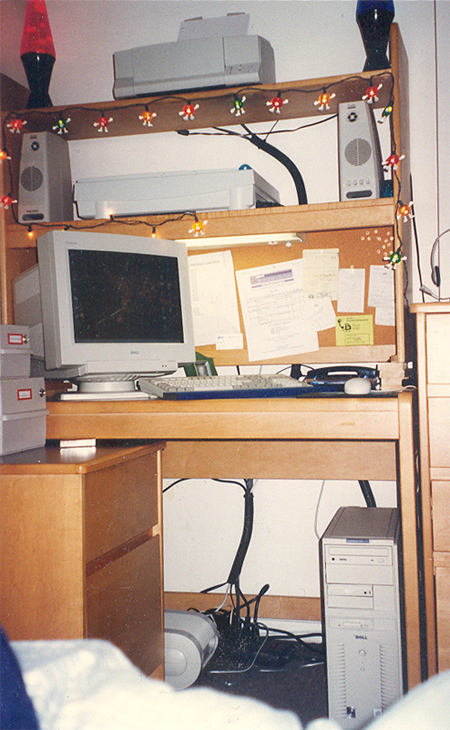 That fossil on the desk is a Dell, from what I recall: Pentium 266, 7GB HD, upgraded to a Voodoo card with 16MB. Don't really remember how much RAM it had, probably upgraded it to 64MB at some point. I do believe until the end of its life it ran Windows 95. It actually was a very good machine. This is my 2009 home-away-from-home while working for the Reagle Players. The apartment is a grad student dorm at Bentley College. The furniture is strictly dorm-quality, but sturdy. When I moved in this year I decided to turn the kitchen table into my desk (since I always eat at my desk anyway), due to its depth and size. 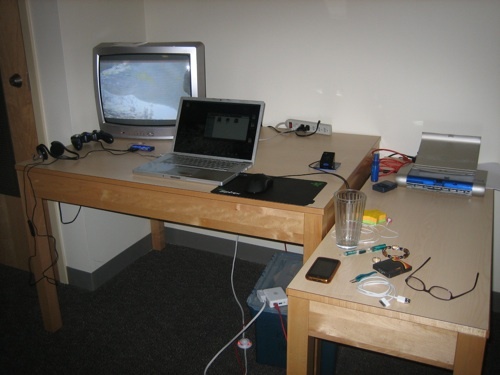 I have always been disappointed with the small size and short shelves of the dorm desks here, so I decided to just spread out on the wide table, and to add a side table, which I always do. The depth of the table also made it possible to put the TV where I can watch comfortably while working on the computer, or while sitting on the couch. I live here for three months at a time, so there's plenty of incentive to have it set up comfortably. It's not designed to be attractive, but just to be functional. Everything is within easy reach, since most of it needs to be able to break down to be brought to work. The power strip is on top of the desk behind my laptop so I can easily unplug my AC adapter to put it in my bag when I'm going to the theatre. I haven't been bringing my printer to work this year, but if I needed to everything is also on top of the tables to make that easy as well. Under the desk is my storage box, which serves as a little shelf. On top of it is an extension cord which has a foot switch (purchased at Radio Shack), which powers my router (an Airport Express). The foot switch is something I've wanted to buy for my apartment for a while, to reboot my router and modem easily (which are in need of rebooting far too often!). I'm excited to be bringing that home after the summer. The location of the router also makes it easy to unplug to bring to work, though I rarely do that. Finally, there are the things that are meant to stay on the desk -- mostly gaming peripherals. I have a small USB hub (also from Radio Shack), which is connected to my gamepad (a Saitek P990, which I recommend if you travel and can't bring a full-size joystick), and my cheap lightweight USB headset (once again I'm the poster girl for Radio Shack!) which I purchased this summer while I save up gift certificates for the amazing Razer Megalodon. In my other USB port is my Razer Mamba wireless mouse. And on the desktop is the new Razer Sphex super-thin mouse pad. The furniture of course was supplied by the school. The shelves were good, but like all shelves, I have a problem in that I can't actually see anything up there, so doing anything with the printer or scanner usually involved standing on a chair. Here I am, on my 11th birthday in 1990, settling in with my first computer. The game on the screen is Ski or Die, which was to become one of my favorites. 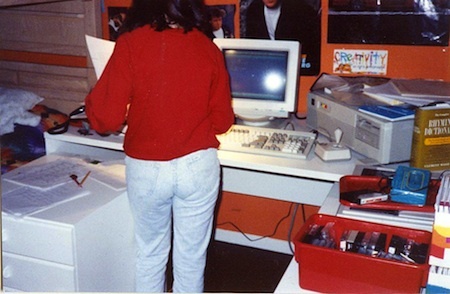 The computer was a no-name brand, what was then called an "IBM clone." 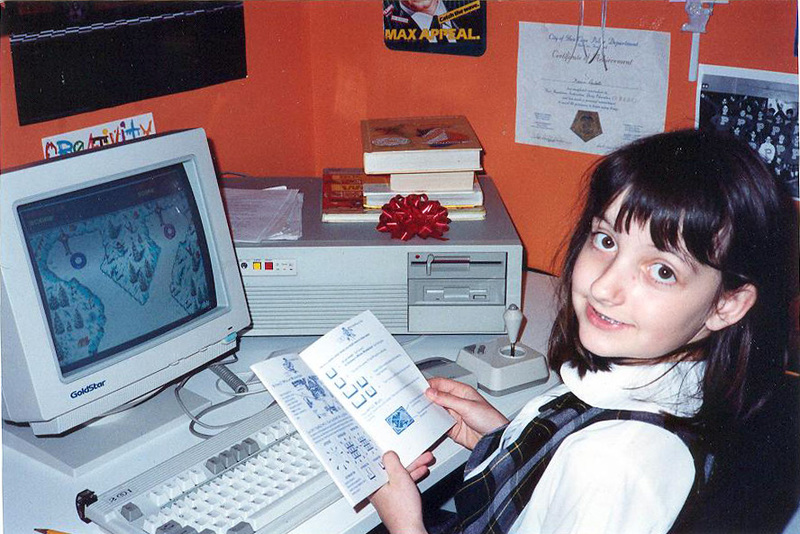 My computer programming teacher from gifted camp (dork, I keep telling you) sold it to my parents and loaded it with the software we used in class, as well as some games and utilities. Here's a terribly-composed picture that shows more of how my desk was set up. This desk began my lifelong love of L-shaped desks, and I have pulled out the filing cabinet to provide even more room to spread. 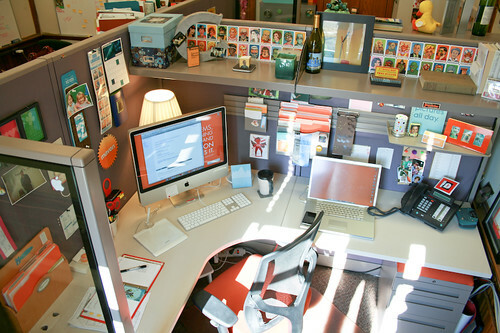 I have 32 square feet of contiguous desk space right now, and I still want more sometimes. 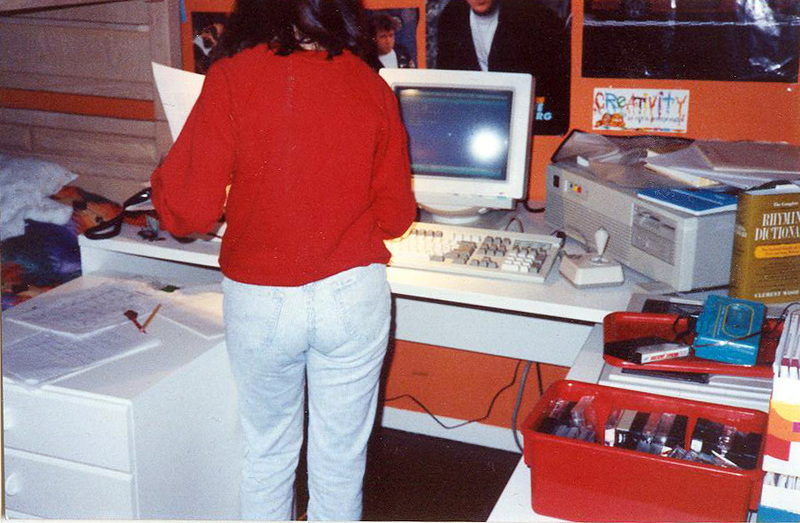 Also note the New Kids on the Block posters, which were a requirement of female child bedrooms of the era, and the poster on the upper right is of a red Ferrari Testarossa, which if you've read my theatre bio, you will see I wasn't kidding about. I also need to explain the orange walls. I had orange walls before orange walls were acceptable and cool to show in an IKEA catalog. I had orange walls and a blue ceiling because the Mets won the '86 World Series, and were awesome. Sadly, children today are probably not growing up with orange-and-blue bedrooms. I recall when we moved it took at least four coats of paint to get rid of the color enough that the house could be shown to potential buyers. 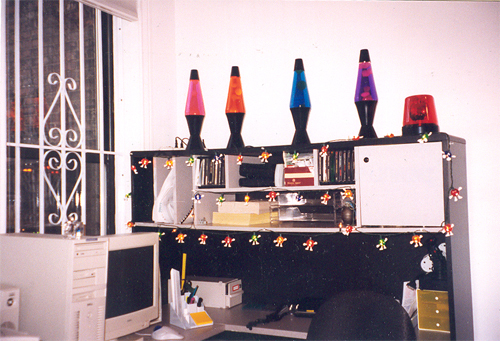 I guess now that I think about it, I've been very attached to my desks long before there were computers on them. 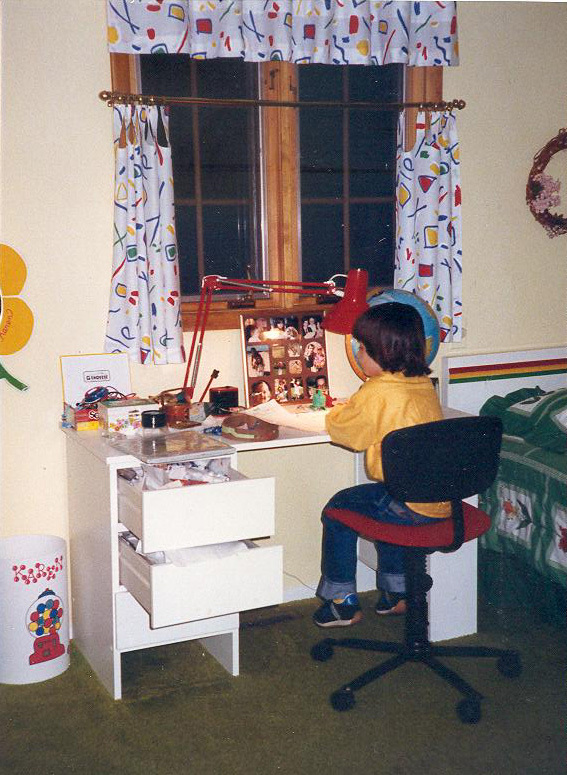 I remember thinking this desk was the coolest thing in the world when I got it. This picture was taken in 1986, when I had just turned seven (so in first grade). I don't know where my typewriter is, because I was pretty much glued to it from the moment I got the desk. It was my dad's old manual typewriter -- I never used an electronic one. But as you can see, I didn't have a lot of space (look what a mess my drawers are! ), and I recall my mom making me pack it up in its travel suitcase when not in use, so maybe that's where it was. My globe was also a subject of constant study, and perhaps my favorite part of the desk is out of view: the leg on the right was a bookshelf facing the bed, which probably began my lifelong love of reading in bed. It was filled with many educational books, and whole bunch of Nancy Drew mysteries. In fact I have a half-height bookshelf to the side of my bed right now, I guess in some effort to return to the convenience of that first bedroom. 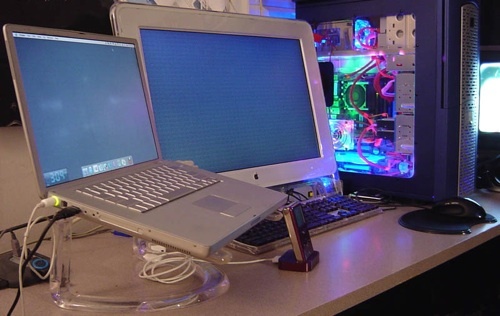 This thread on the MacNN forums where everybody posts pictures of their Macbooks. It goes back about 6 years so not all the links still work, so I recommend you start with the most recent pages. One of my favorite blogs is LifeHacker, which has a regular feature profiling people with an interesting or attractive work space. These posts are always a good inspiration. I wish I could paint my walls. 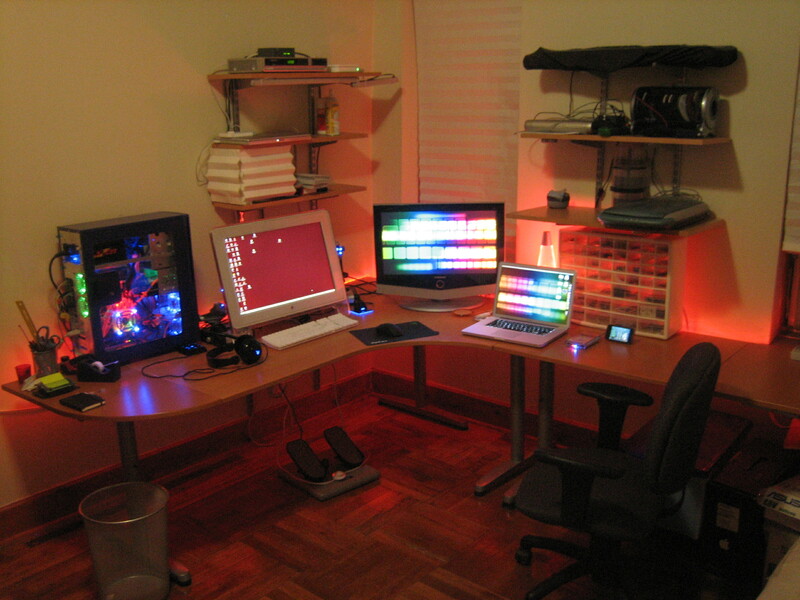 I wish I could afford a nice shelving unit like that, and three monitors, and a TV that big. 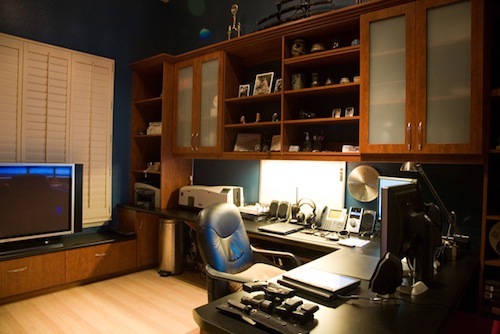 Decluttered.com offers a cool technique for mounting pretty much anything under or behind your desk using an easily removable pegboard. I haven't tried it yet, but it's interesting. That link was sent in by my friend Justin. 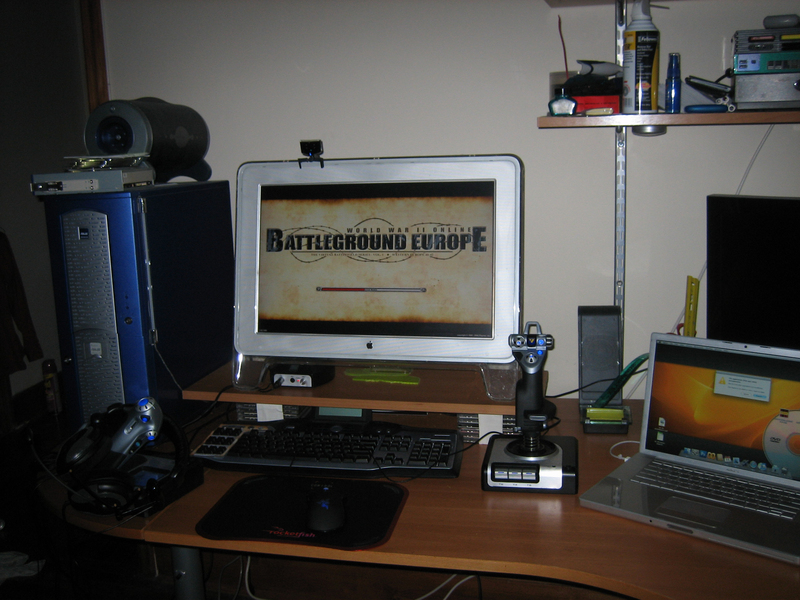 This busy setup belongs to a member of my Battleground Europe squad. I especially find it interesting to see how people who play the same game as me handle things. 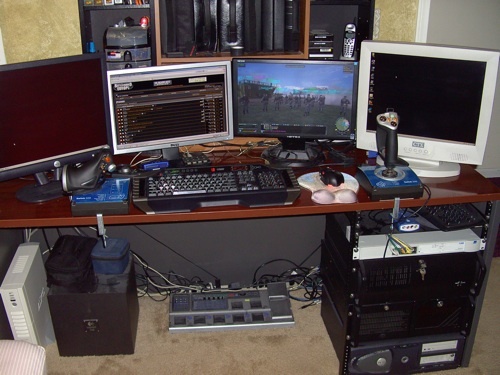 This is kind of similar to the setup I have, with my joystick and throttle on the outside of the keyboard and mouse. For some reason I prefer to keep the mouse in front of the keyboard rather than side-by-side. 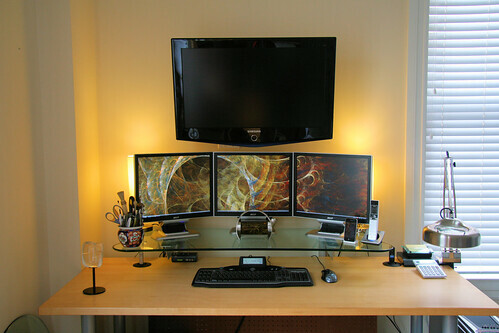 Oh, and I use one monitor instead of four. But I do usually use my laptop when playing the game to check stats and things, so it's kind of the same idea. Except less cool. 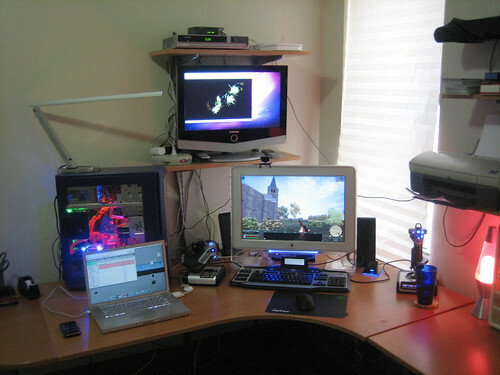 When I moved into my current apartment I bought a very similar Samsung TV, with dreams of mounting it on the wall above my computer to save desk space. What I found is that the wall in question is of questionable structure, and that I have plenty of desk space for a thin TV to sneak in the back. 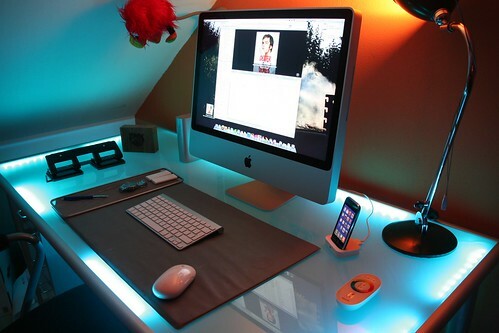 But this is slick. I have no idea what's happening here, but is it not cool? 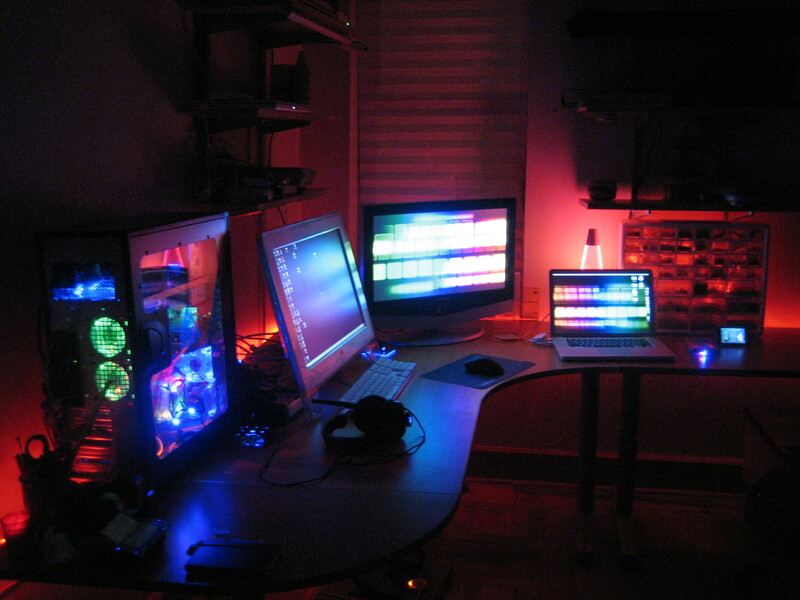 I want to do something with cold cathode accent lighting someday. You can actually see in some of my photos I have a cold cathode tube randomly stuck to the side of my PC, waiting for someplace interesting to go. Nice simple use of color.